Every graduating class wants to leave its mark on USC’s campus. Now, every class can. On April 17, the Skull and Dagger Society commemorated its 100th anniversary at USC by giving the university “class markers” — plaques displaying the year of each graduating class. The markers are embedded in the brick wall lining Alumni Walk, located on the south side of the Ronald Tutor Campus Center. The class marker tradition began in 1887, when USC’s first class immortalized its graduation year with a commemorative plaque on the exterior wall of the College of Liberal Arts building. After the building’s demolition in the 1940s, the university meticulously reinstalled the 1887 to 1936 markers in Founders Hall. Markers for the classes of 1937 to 1948 decorated the pavement in front of the Bovard Administration Building. But dark days were ahead for the class markers. In 1949, the class marker tradition went on hiatus for the next half-century. In 1982, Founders Hall expanded to become the Taper Hall of Humanities, and all but one of the pre-1936 class markers were lost during the construction. When Jerry Papazian ’77, current president of Skull and Dagger, learned of the markers’ history, he decided it was time to restore the tradition. In 2000, the honor society commemorated the first graduating class of the new millennium by embedding a class marker made of cardinal-colored granite in the Bovard pavement, and subsequent classes have followed suit. Skull and Dagger also wanted to honor the pre-1936 classes with markers that had been lost. So Shane Swerdlow ’10 helped produce replicas based on the only surviving reference materials: the remaining class of 1925 marker and a black-and-white photograph. “It’s really exciting to work on an important part of our Trojan heritage that went missing several decades ago,” he said. Skull and Dagger has also been creating markers for the classes that graduated during the years 1949 to 1999 when the tradition was on hiatus. During the April 17 ceremony, Papazian unveiled USC’s collection of class markers — both replicas and newly relocated originals — on Alumni Walk. 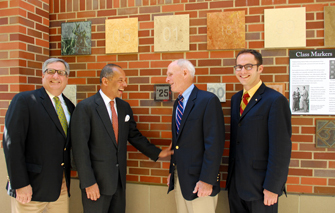 Papazian revealed the marker-studded brick wall to applause, and Vice President for Student Affairs Michael L. Jackson accepted the gift on behalf of the university. Thanking Papazian, Jackson expressed what the commemoration meant to the Trojan community.